Feather loss can signal anything from serious illness to unhappiness in your lovebird. In some cases, feather loss is normal and healthy. If you are unable to determine the cause, seek veterinary treatment. Your veterinarian can conduct skin and blood tests and recommend a course of treatment if the feather loss is not normal. Lovebirds go through a normal molting period twice each year, usually in the fall and the spring. During this time, old feathers are replaced with new ones. The old feathers fall out, making it appear that your bird is losing large amounts of feathers. A normal molt occurs bilaterally, or equally on both sides, and the new feathers are already emerging before the old ones fall out so that your lovebird's skin is not exposed. Your lovebird may pluck his own feathers if he is feeling bored, stressed, frustrated or uncomfortable. This plucking usually occurs in uneven patches and results in bare skin. Give your bird more attention, toys and entertainment and make sure that he is not stressed by other animals or activity in your home. Pairs of lovebirds kept in the same cage will sometimes pluck feathers from each other. This is known as barbering and is also often caused by boredom or stress. If your lovebird is not receiving all the nutrients he needs to stay healthy, he may start to lose feathers. The feathers will drop out in irregular patches and remaining feathers may be dull, brittle and weak. Offer your lovebird a well-rounded diet that includes pellets or seeds, fruits and vegetables. Bacterial and fungal skin infections, such as streptococci and ringworm, can cause feather loss in either ragged or regular patterns. 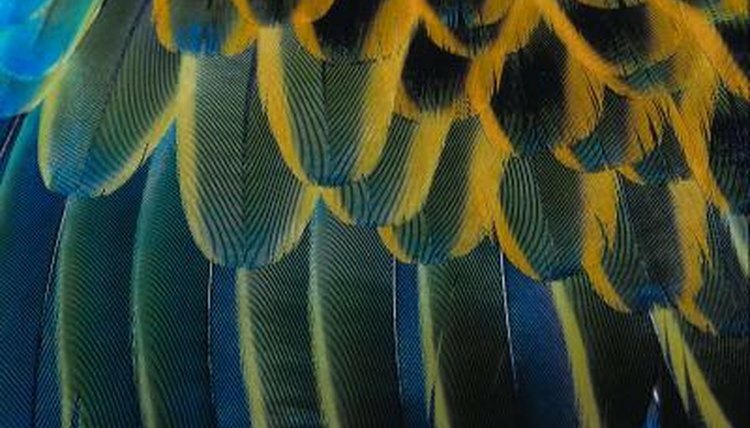 The skin revealed by the feather loss may be red, swollen or irritated. The underlying cause of the infection must be treated in order to stop the feather loss. Your veterinarian can test to determine the cause and prescribe treatment. Circovirus, known as beak and feather disease, is uncommon but can cause feather loss. Liver and kidney problems can also result in feather loss, as well as tumors and severe illness, such as pneumonia. Your bird's skin may also be irritated by foreign substances, such as lotion, ointments or oils from your hands, which can result in plucking and feather loss. Improper trimming of your lovebird's wings can also result in feather loss.